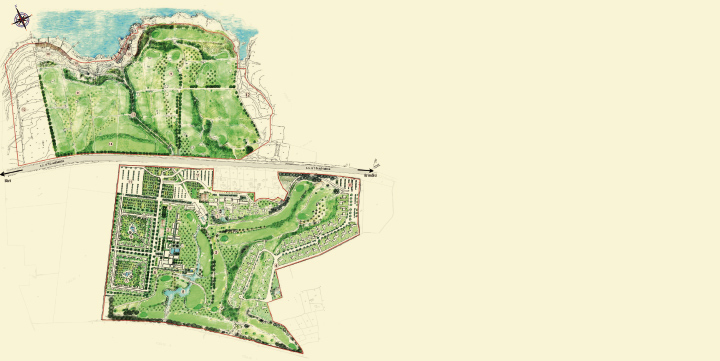 The implementation of the Costa dei Trulli project highlights the potential and vocations of the area characterized by the following favorable conditions. • The Costa dei Trulli area is located in the province of Bari, in the town of Polignano a Mare. • Costa dei Trulli is bordered on one side with the sea and on the other side of the railway line Bologna-Lecce and is crossed by the highway SS 16, from Bari to Lecce, and his two co-planar roads, which provide direct access to the sites. • The exit of the A14 motorway, airport, port and railway station of Bari are located approximately 35 km north-west. • The context in which Costa dei Trulli appears is exceptionally pristine and most of the area is planted with olive trees. • The area has a sea front of over 1000 m, characterized by the presence of numerous trulli in stone material, which give the skyline a connotation of particular aesthetic value and environmental sustainability. • The coast is low on the sea level and rocky. The main tourist attractions (landscape, historical and cultural) of the territory are: Polignano a Mare (5 km), Grotte di Castellana (15 km), Alberobello (24 km), Bari (29 km), Ostuni (45 km), Matera (64 km), Brindisi (75 km), Trani (76 km), Castel del Monte (82 km), Barletta (84 km). • care of environmental impact: the absence of buildings put to impacting on the landscape and the enormous extention of the natural characteristics of the park, involving the upper area in a single environmental organization. • effects extended to the entire region: the action will result in the development and strongly influenced the polarization of international interest in the entire region.